Rated payload for Cat's new 777G is 98.4 tons (89.4 MT), with a standard-body volume (SAE 2:1) of 83.8 cubic yards (64.1 m3). The design of the 777G, which replaces the 777F, focuses on fuel efficiency, enhanced visibility, and operator comfort, convenience and safety. The 777G's Cat C32 ACERT engine meets US EPA Tier 4 Final as well as EU Stage V emission standards and is available in configurations to meet emission standards of less regulated (LRC) countries. The engine delivers 1,025 gross horsepower (765 kW) and incorporates a number of fuel-conservation features. In addition, the 777G has two operating modes, Standard Economy and Adaptive Economy. Standard Economy saves fuel by reducing engine power by 0.5 to 15%, based on the fleet and economic conditions at a particular site. Adaptive Economy requires a production baseline for the site using the Advisor display, and then, as the truck travels the haul cycle, the system automatically evaluates the power rating needed to meet baseline requirements. Full power is applied when needed, and reduced power is applied when appropriate. The efficiency of the 777G's performance is further enhanced by 7% more engine torque and an increase in top speed. The 777G features a redesigned cab, easier to enter and exit, and a new operator seat on the left and a more comfortable trainer seat on the right. A new console with an integrated hoist-and-shift lever enhances convenience, as does more interior space for storage. The truck's design also emphasises improved visibility, to both the work area and instrumentation, and overall visibility is further enhanced with an optional object-detection system. Convenience items include a powered left window, automatic temperature control, throttle lock for long uphill grades, and reduced interior sound (by 50% compared with predecessor models). 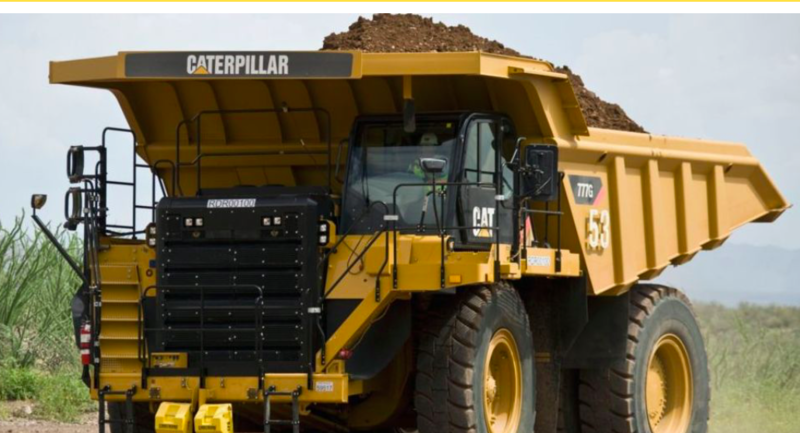 Click here to read about Cat’s recent autonomy milestone.